Despite the growing popularity of pizzas, pastas and everything from Mexican to Chinese food in India, the fact is that our own desi cooking continues to sway the popularity polls, winning by a large majority. This could be because our palate is accustomed to our native style, or because of the exciting variety that Indian cuisine offers. There is such a large selection of recipes available in our multi-cultural country, specialties and variants from every state and every community, that you can always find the perfect recipe to please a person or to suit an occasion. 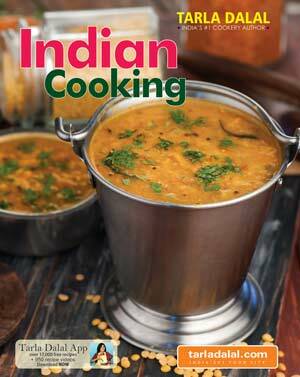 In this book on Indian Cooking, we attempt to represent this variety, taking the best picks from various parts of India. From vada to samosa, from sambhar to subzi, you will find a range of 45 delectable recipes in this book, sorted according to the course of the meal, right from soups and starters to snacks, vegetables, dals, kadhis, rotis, rice, accompaniments and of course, irresistible desserts.